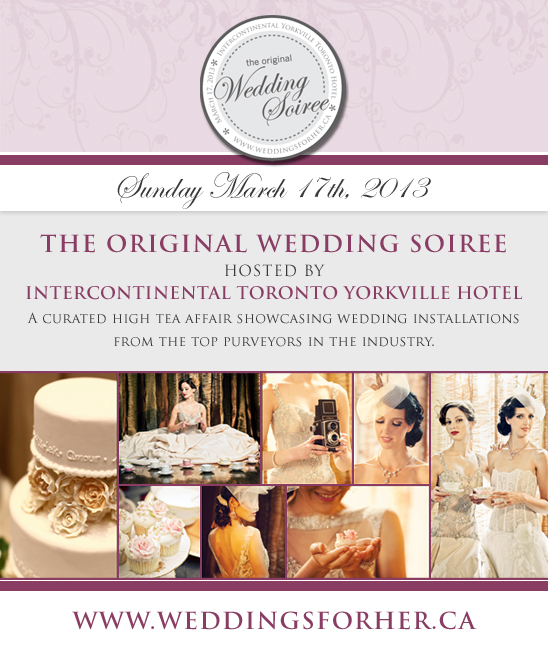 The C&C Girls are excited to attend the hottest most elite Bridal event showcasing a collection of Artisans, Designers and Visionaries, hosted by Intercontinental Yorkville Toronto Hotel on March 17, 2013. The Original Wedding Soiree is a themed bridal event for the elite and modern clientele featuring vignettes and installations. “We have created an event that showcases and brings to life the very best of wedding visionaries and artisans available to Brides-to-be, who do not want the cookie-cutter wedding and want something original and unique.” The Original Wedding Soiree has created a platform for the finest event purveyors to showcase their work in prestigious venues. The venue where the event is being hosted for 2013 has been chosen because they provide a first-class and sophisticated environment for guests, vendors and clients. The event includes more than 70 distinguished modern weddings vendors and artisans. Guests will be treated to high tea with scones and finger sandwiches throughout the day while viewing a non-traditional runway show and previewing live entertainment for all musical palettes. High Tea Seating is available from 10am to 4pm - no reserved seating is required and the room is open for the duration of the event the guests’ enjoyment. Fashion Show Times: 11:30am, 1:30pm and 3:30pm. 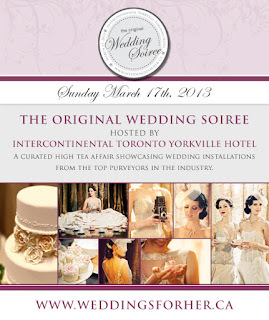 Tickets are $35 at www.weddingsforher.ca and only available in advance. Admission includes signature cocktail, assorted teas, scones with preserves and devon cream, finger sandwiches, and berries with whipped cream. The ticket also includes entrance to the Bridal Beauty Bar with hair and makeup stations, all workshops, a non-traditional runway show while sitting for High Tea and scoping out the innovative wedding installations.